The long and close association Everards Brewery has had with the armed forces was highlighted once again with the production of a new guest beer to help raise money for a memorial for the 10th Battalion, the Parachute Regiment. Just as its flagship beer, Tiger, derived its name from the Leicestershire Regiment (the Fighting Tigers), the September 2017 brew ‘Myrtle’ is supporting the Friends of the Tenth campaign to erect a stone memorial in Somerby. The full story of Myrtle can be found elsewhere on this website, but in short, Lt. Pat Glover of 10 Para wanted to prove that chickens could fly, so he acquired a red hen, Myrtle, in 1944. Pat taught her to flutter down 300 ft on practice jumps, but at the Battle of Arnhem, the parachick was ‘Killed in Action’ along with the vast majority of the Battalion which was later disbanded as a result. The brewing of Myrtle follows on from Tiger and also the occasion a few years back when Everards combined its brewing skills with an acknowledgement of the WW1 armistice when making Regimental its November special. On Monday 21st August, Everards’ marketing staff, Claire Cannell and Kia Ryan, were on hand at the Cradock Arms in Knighton to launch Myrtle in the company of a small group from the Friends of the Tenth. Although described as Amber Bitter, Myrtle is more akin to a Red Ale with the complexity and depth of colour that one associates with such beers. Despite having no fruit in the brew whatsoever, the unusual characteristics peculiar to the Pilot and Flyer hops result in a distinct taste of dark summer fruits such as blackcurrants or blackberries and a roundness of “mouth feel” more associated with a red wine such as Merlot. Remarkably, it also gives the impression of being far stronger than its 4% (abv) rating, so whilst very easy drinking, there is also something about it that makes you want to savour it respectfully and slowly. In short, exactly the sort of beer that would be perfect with a cheese board or pork pie to be honest. Everards’ monthly beers are seldom available for more than a couple of years, but this one is most definitely deserving of several repeats, not only because I believe it’s the best new monthly they’ve created in three years, but also because of the reason for its existence. You see, Myrtle did not die in vain and her name lives on because 5p per pint of this commendable brew will be donated by Everards to the Friends of the Tenth to boost their fund-raising for a permanent and fitting memorial in the Leicestershire village of Somerby to the brave young men of the 10th Battalion who were stationed there. FRIENDS of the Tenth are delighted to announce that Her Majesty’s Lord Lieutenant of Leicestershire, Jennifer, Lady Gretton DCVO JP has become the group’s Honorary President. 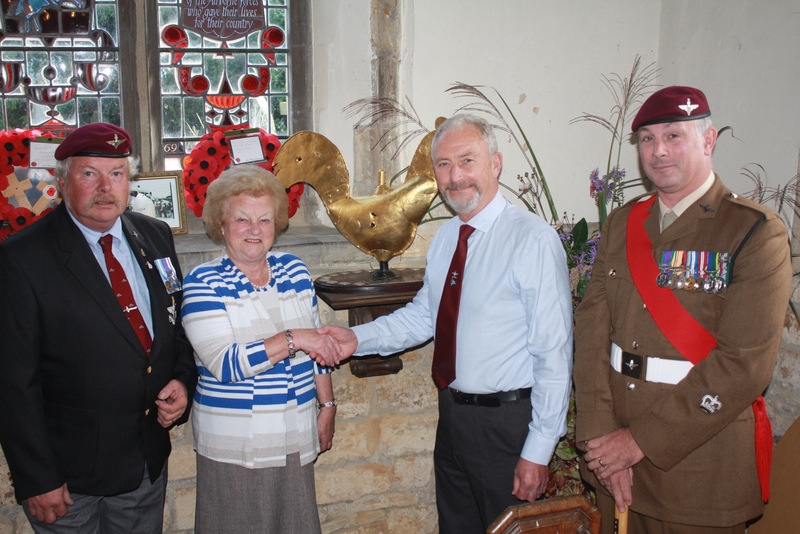 Lady Gretton has accepted an invitation from Friends of the Tenth to be the figurehead leading the fund-raising campaign, which is committed to creating a stone memorial for the 10th Battalion, the Parachute Regiment close to where she lives in Somerby. Friends of the Tenth is a group of like-minded people who recently launched the appeal to £75,000 to perpetuate the memory and legacy of the Battalion, which was stationed in Somerby in the lead-up to Operation Market Garden in the Battle of Arnhem in 1944. “I feel very honoured to be asked to become President of the Friends of the Tenth, which is an amazingly worthy cause,” commented Lady Gretton. “It is only right that we should do all we can to recognise the sacrifices these people made for this country by creating a lasting memorial in the village. As Her Majesty the Queen’s representative in the county of Leicestershire, Lady Gretton’s role encompasses many different duties and responsibilities, one of which is to liaise with local units from the armed forces and their associated cadet forces. This is a cause close to her heart because as a long-time resident of Somerby, she has been a member of the Committee of Somerby Parochial Church Council since 1991 and served as a Church Warden of All Saints Church from 1992-1995. She is also Patron of five Parishes in Leicestershire and Staffordshire, and is patron or president of a wide range of local charities and organisations. Alec Wilson, Chairman of the Friends of the Tenth group, commented: “We feel extremely privileged that Lady Gretton has agreed to help us in this way. He added: “We have been overwhelmed by the magnitude of support which we have already received in the initial stages of our fund-raising, and I know that Lady Gretton’s involvement can only give those efforts even more impetus. A 95-YEAR-OLD Arnhem veteran has given his backing to the appeal to raise £75,000 for a stone memorial in honour of the 10th Battalion, the Parachute Regiment. 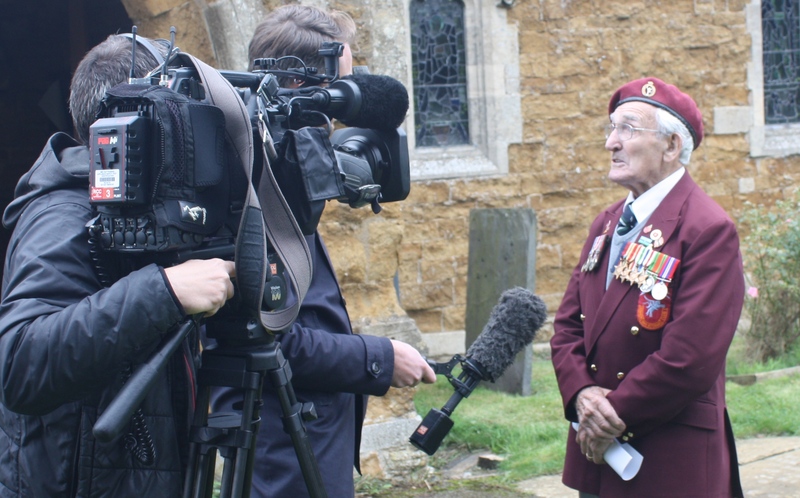 John Jeffries attended the annual Somerby Commemoration recently before heading out to Holland to recreate the parachute jump he made during the Second World War. A member of the Royal Corps of Signals, he decided to come out of retirement to make two drops to help raise money for charity and also remember his fallen colleagues. Those jumps made it a particularly special Arnhem commemoration, 73 years after he was shot and taken prisoner during Operation Market Garden over Holland. “It’s wonderful to see the 10th Battalion being remembered in this way,” he said, before taking the salute during the parade at the Somerby Commemoration. “We were like a band of brothers, and although I was in the Royal Signals, we operated alongside the 10th Battalion and 156 Battalion, so we got to know them well. He added: “I feel slightly embarrassed with all the attention these days, but I do believe it is important that people remember what happened out there. Jeffries undertook his first parachute jump with the Red Devils in Peterlee to raise money for the Northumbria Blood Bikes charity before then heading out to Arnhem for the second drop which took place as part of the annual commemorations in Holland. “At least I wasn’t being shot at this time,” he said. “I wanted to parachute into Arnhem again to remember all the boys who weren’t so lucky. “I consider myself to be the luckiest man in the world that I was able to survive, despite being shot in the backside. I have so much to be thankful for. 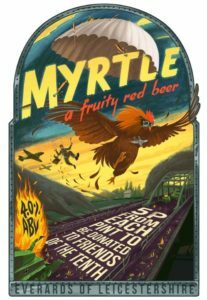 THOSE of you eager to sample the new Myrtle ale brewed by Everards in support of the Friends of the Tenth campaign will be interested to know the pubs where it is now in stock. 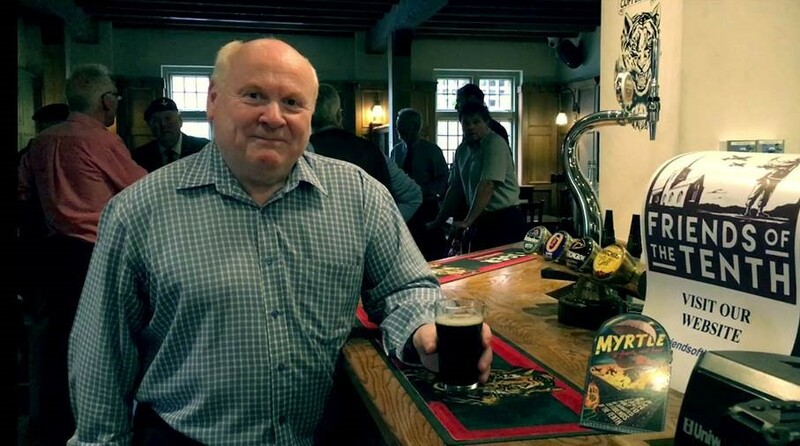 The family-run Leicestershire business have reported an excellent uptake of the ale in the first two weeks of September with 65 pubs already stocking the cask ale appropriately named Myrtle. That figure is likely to grow over the coming days, due to the live nature of a cask ale meaning that pubs landlords must manage their stock very closely and then sell it as quickly as possible. Therefore, the list below is of Everards pubs who have taken delivery of Myrtle recently and will be putting it on sale within the next few days once it has conditioned in the cellar. 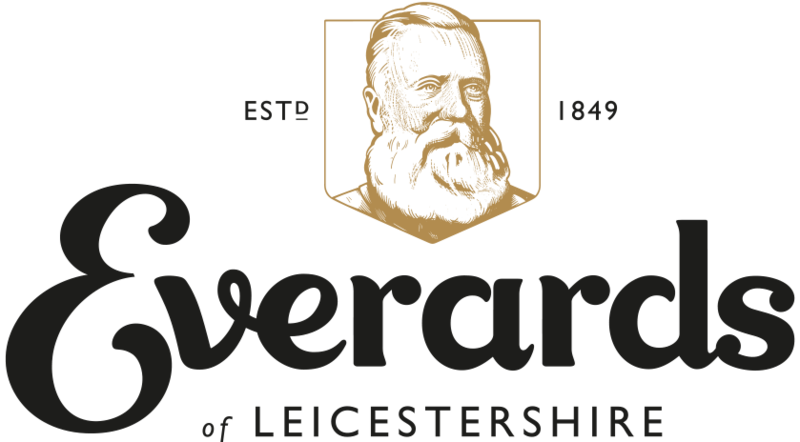 Five pence from each pint of Everards’ latest, specially-brewed guest beer sold during the month of September will go towards the Friends of the Tenth fund-raising which aims to raise £75,000 for the creation of a stone memorial to the 10th Battalion, the Parachute Regiment. 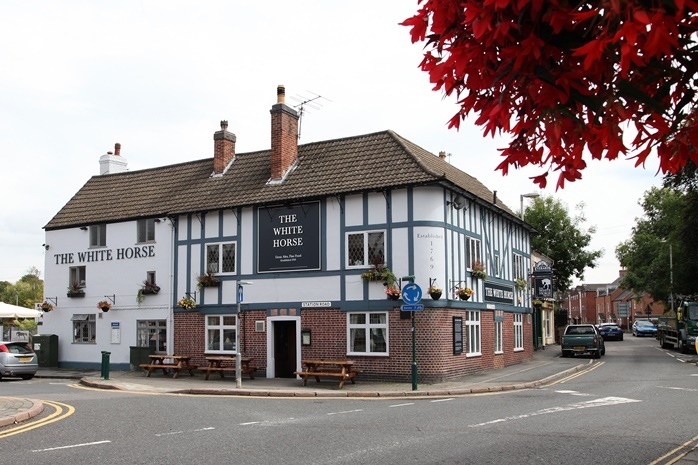 In addition to the pubs listed below, Myrtle will also be available at the Stilton Cheese in Somerby during the annual Commemoration weekend from September 8th to 10th. *Please remember, it is worth checking with the pub you are planning to visit that Myrtle is on sale, as there is a short delay between the delivery and it being made available.